Key Difference: A roti is a type of Indian flatbread made from atta (whole wheat flour). A phulka is a specific type of roti is partly cooked on a tava (flat skillet) and partly on an open flame leading to the phulka to balloon up. Roti, Phulka, chapatti are just some of the words that one will commonly come across in Indian cooking. In fact, most Indian meals consist of at least one of these things. However, what is the difference between each of these things. Depending on who you ask, you may get different answers each time. Someone will say that they are the same thing, and that these are just different names for the same thing. Someone else will say that each one is prepared differently and that each one has a distinctive characteristic that labels each one specifically. 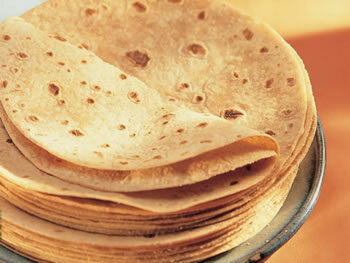 In the most common parlance, a roti is flattened bread made out of dough of whole wheat flour, locally known as atta. There are many various different versions of this flatbread. Each person adds a little variety to the recipe depending upon personal preference, ease of cooking, or according to the recipe passed down in their family. Due to regional and cultural difference, this flatbread may be called as roti, chapatti, phulka, or something else entirely. The process of making a roti primarily includes making dough from the atta and water. Some people add oil or milk depending on personal or familial preference. This changes the texture of the dough a little. The dough is then kept to proof for varying amounts of time. Some keep it for ten minutes, others for over an hour. The dough is then separated into small portions which are then rolled out into a circular shape. This ‘roti’ is then cooked on top of tava, a type of flat skillet. While most variations follow this, it can be said that a phulka is slightly different. A phulka generally follows the same process as a roti, except that instead of being completely cooked on a tava, the phulka is partially cooked directly onto the flame. This causes the phulka to balloon up, with hot air filling it and subsequently filling it from the inside. However, many people still refer to phulkas as roti. The problem in differentiating between them comes from the fact that there are various different opinions as to what a true roti is and what the other terms refer to. While there is no general concensus on the matter, it is generally accepted that a phulka is a specific type of roti that balloons up while cooking. Phulkas are generally considered to be thinner and softer than a typical roti. However, phulkas also have a tendency to get hard and crispy when left open and exposed, which is why they are often kept in a container with a closed lid immediately when removed from the flame. Yet, these characteristics are still often a manner of debate depending on the terminology that people grew up using. 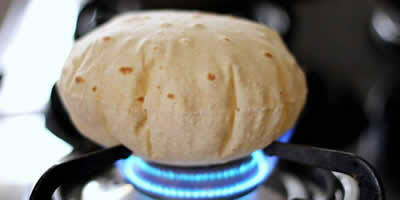 After one side is cooked, remove the tava and flip the roti directly onto the flame.